Citation: Halmatov M, Ismailhodjaev B, Assomidin K. Influence of Wooden Plants at a Microclimate of the Atmospheric Environment. Biotechnol Ind J. 2018;14(6):180. The order of protection of atmospheric weather, methods of monitoring its condition determines, as well as establishes other requirements for the protection of atmospheric weather. Standards for the industry of atmospheric weather protection (sanitary norms) for people are approved by the Ministry of Health of the Republic of Uzbekistan. For environmental objects, standards for the protection of atmospheric weather, climate and layer conservation are ozonized by the State Committee for Environmental Protection of the Republic of Uzbekistan. In this, we studied the effect of harmful substances in the air on the synthesis of pigments in the leaves. In order for the protection of atmospheric weather, the various methods of monitoring its condition determine and establish the other requirements for the protection of atmospheric weather. The standards of the industry of atmospheric weather protection (sanitary norms) for the people are approved by the Ministry of Health of the Republic of Uzbekistan. For environmental objects, standards for the protection of atmospheric weather, climate and layer conservation are ozonized by the State Committee for Environmental Protection of the Republic of Uzbekistan. Enterprises and organizations producing chemicals or their users develop standards for the collection of such substances in the atmospheric air to the permissible extent. Methods for their control and environmental-toxicological passports are according to the established procedures of the State Committee for Environmental Protection and the Ministry of Health of the Republic of Uzbekistan. Neutralization of the chemicals which are prohibited for use and are unfit are carried out with the approval issued by the State Committee for Environmental Protection and the Ministry of Health of the Republic of Uzbekistan. The chemicals which are allowed to be used are plant protection products, their growth accelerators, mineral fertilizers and other preparations only in the ground position. The processing of agricultural plants with the use of chemicals should be in the manner prescribed by the law . Air pollution occurs mainly as a result of a waste generated from large enterprises and vehicles. More trees are wrecked along major trunk roads form the motor-generated waste of carbon oxide (CO), nitric oxide (NO2). As a result, the leaves of the trees suffer more from harmful substances, because in these leaves photosynthesis occurs and many other processes ensure their growth. Therefore, the effect of air pollution is of great practical importance to study the appearance of green and yellow pigments participating in the processes of photosynthesis. For a long time, there is a relatively constant amount of main gases in the atmosphere. In recent years, as a result of the increased influence of human activity, a change in the gas balance has been observed. It is known that the change in the constant amount of gases in the atmosphere will entail negative consequences for the planet. It was determined that in the coming years, there will be 10 billion tons of CO2 in the atmosphere. The average temperature of the planet's air is increased by 0.5°C. The change in the average temperature of the surface of the earth due to the Greenhouse Effect is predicted to entail heavy social and environmental results. Carbonic acid vapors are generated by collecting CO2 through the release of hydrocarbon gases into the atmosphere and the effect of air moisture on it. This behaves like a glass of a greenhouse and conducts solar radiation well through itself and does not return infrared rays back . As a result, it generates the sinking of air that is The Effect of the Greenhouse. Each year, over 10 billion tons of oxygen is consumed on earth in fire processes. In the biosphere, the intensive reduction of the area of green planting causes an inevitable problem is the reduction of oxygen . Today, one of the main problems of urban planning is the organization of planting works in a scientific manner. Gardening of cities, districts, villages, and settlements are considered the main means of improvement (FIG. 1). Figure 1: Study of the effect of harmful substances in the air on the synthesis of pigments in the leaves. For a person, the most favorable climatic environment is a temperature of 20-22°С and relative air humidity of 40-60%. The air must be clean and enriched with ozone. In cities, air is polluted as a result of the spread of motor and industrial waste. Green spaces are the only means of cooling air. In the process of photosynthesis, the green plantings located on 1 hectare produce oxygen sufficient for breathing 200 people. At the same time within one hour, it depletes about 8 kg of carboxylic acid. In cities, the value is very high with a decrease in the radiation temperature of green spaces. For example, the temperature in the shade of a separate large tree differs relative to the open area at 35°C, and in the green massifs at 40°C. We carried out our studies on the types of trees in the city of Akhunbabaev, Zhalalkuduk district of the Andijan region of the Republic of Uzbekistan. In the dry and hot climatic conditions of Uzbekistan, the tenivization regime is of great importance . The result of the research work was conducted on the objects of research (FIG. 2). The analysis was carried out in the laboratory of the Institute of Genetics and Plant Experimental Biology of the Republic of Uzbekistan (TABLE 1). 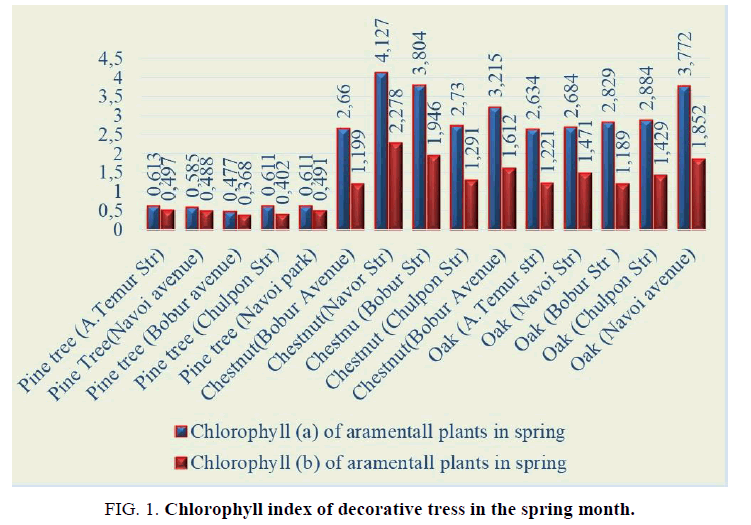 Figure 2: Chlorophyll index of decorative tress in the spring month. Table 1: The effect of harmful substances on the synthesis of pigments in the leaves. 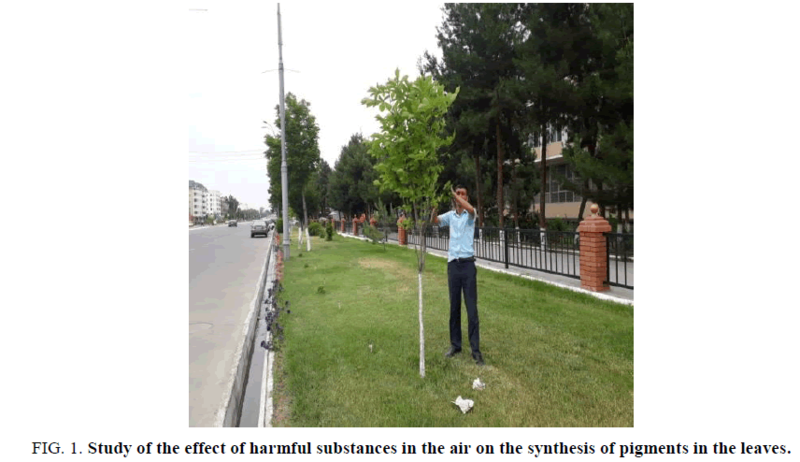 For the first time in the Andijan region of the Republic of Uzbekistan, as a result of studying the influence of harmful substances in atmospheric air on the survivability of ornamental trees on the synthesis of pigments in the leaves, the effect of heavy metals, the corresponding types of ornamental trees and methods to reduce the effects of harmful substances are identified. Uzbekistan. Constitution of the Republic of Uzbekistan: Adopted on December 8, 1992 at the Eleventh Session of the Supreme Council of the Republic of Uzbekistan, Twelfth Convocation, Uzbekistan. 1992. Guderian R. Pollution of the air environment. M World. 1979:198. Stokes KM. Man and the Biosphere. ME Sharpe. 1992.